Music for Neighborhoods is a project that produces intermittent concerts in architectural or historic landmarks in Pittsburgh and surrounding communities, often combined with a walking tour of the surrounding community. Pittsburgh’s distinctive neighborhoods are one of the area’s most unique assets, yet many are unknown even to long-time residents. A guided tour and short lecture, combined with a musical program, provide a marvelous opportunity for the public to learn more about local heritage. Music for the concerts is carefully selected to complement the architectural site and/or reflect the cultural or ethnic nature of the surrounding community. The project was started in 1985 by another organization called Music in Pittsburgh, founded by Donald Downs. The Renaissance City Winds assumed production in 1987. Over the years, events have taken place in churches, civic auditoriums, outdoor parks, historic homes and estates, a unique planned Utopian village built in the 1930s, and libraries, including the world’s first Carnegie Library! 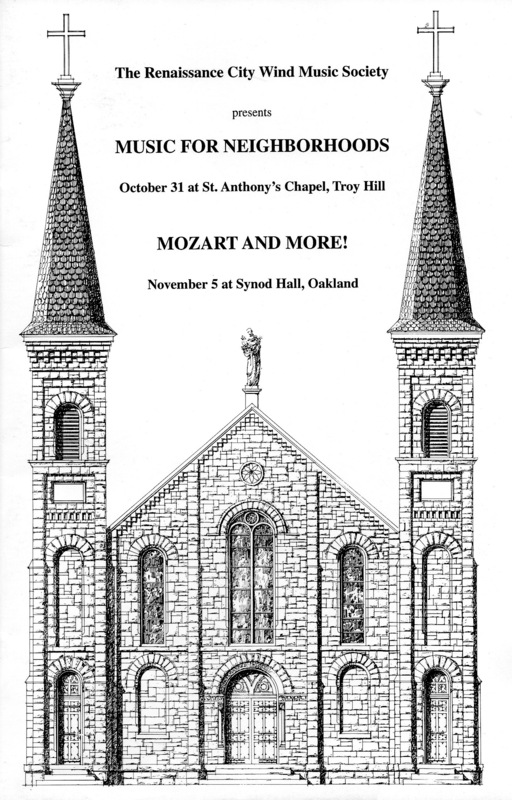 Here’s a sample program, with a cover drawing of St. Anthony’s Chapel, in Troy Hill. These gorgeous souvenir posters were hand-drawn by architect John Martine. St. Anthony’s, the only private Catholic chapel in the United States, is in a community predominately settled by Germans, so the Winds collaborated with the Pittsburgh Camerata in a program of German choral and instrumental music. 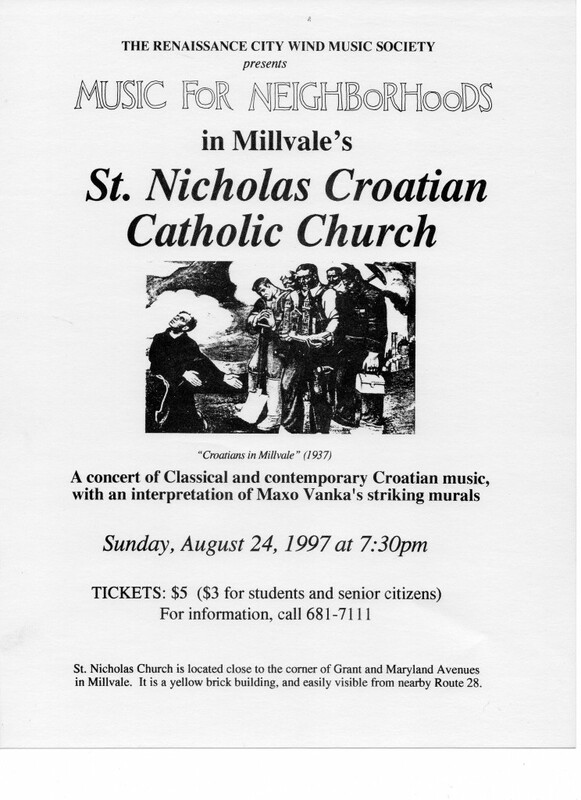 Next is the poster from one of the most unusual events, which took place in a church whose interior is entirely painted with murals depicting the life and spirituality of Croatian-Americans. A musician who was a refugee from the Bosnian war helped the Winds assemble an entire concert of Croatian music; some of the works were still in manuscript and received their American premieres on this program.